On the verge of our first anniversary and with Christmas just around the corner too, I felt we needed something special to celebrate and thank you all for your ever growing visits to Bronson Pinchot Online. Send an email to promo@bronsonpinchot.org telling us WHY do you like Bronson in any way you like, in the form of a poem, a picture, a video, or anything you set your mind to. 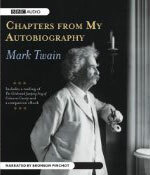 The most creative answer will win a copy of one of Bronson’s latest audiobooks, “Chapters From My Autobiography” by Mark Twain in MP3 format so you can listen to it in your computer or MP3 players. “…Mark Twain’s material is wonderful, as always, but Bronson Pinchot’s performance is what both seals and steals this production as a classic (and it should win many awards). Heart-breaking in parts, laugh-out-funny in many parts (and that’s not the usual review hyperbole), and always historically engrossing, I highly recommend “Chapters from My Autobiography” (and keep your eyes, especially ears, on Bronson Pinchot)”. Douglas, CO.
“I don’t know what Mark Twain sounded like, but this sounds right to me. Mark Twain was a very successful lecturer, so he must have been entertaining to listen to, this reading is one of the best I have heard in years of recorded books. I hope Bronson Pinchot can work his way through the Twain catalog. He could really make “The Innocents Abroad” come alive”. David, OH. Entries will be closed on December 20th and on December 24th (our 1 year anniversary!) the winner will be announced here. As a special Christmas present to Bronson, ALL the entries will be compiled in a video and posted here on December 25th! Previous PostHawaii 5-0 – Video!Next PostAudible’s Narrator of the Year!